This post is written by Nick Dekker of the popular blog, Breakfast With Nick. You can follow him on Twitter at @BreakfastWNick. On Tuesday, July 16, from noon - 1 p.m., Nick will be doing a book signing in the Experience Columbus Arena District Visitor Center! Come on down, get the book and get some more great breakfast tips from Columbus&apos; leading authority on the subject. To whet your appetite, well be hosting a Twitter chat about Columbus Breakfasts from 9-10 a.m. on the same day. Use hashtag #CbusBFast to follow along, and send questions before we get started. It’s been humid and rainy lately here in Central Ohio, but Columbus residents know how to take advantage of these long summer days. Come February, we’ll all be wishing to be able to start our days outside under the sun. 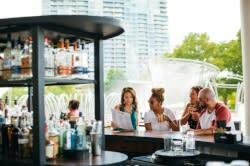 One of the best ways to begin your day is enjoying breakfast on a patio, and fortunately many Columbus breakfast and brunch spots have provided you with some early morning open air dining options. In downtown alone you’ll find a number of small patios that let you enjoy your breakfast while people-watching or architecture-gazing. 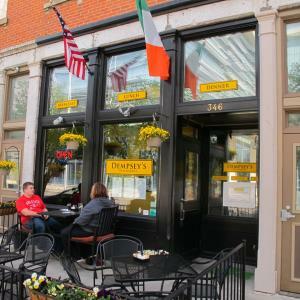 Dempsey’s Restaurant (346 S. High) has a small patio out front with a handful of tables. It’s perfect for looking at the new courthouse while enjoying hash and eggs, steel cut Irish oatmeal, or chocolate chip pancakes. Just up the road, de-NOVO bistro & bar (201 S. High) sports a small patio that’s lush with greenery and balls of flowers. De-NOVO offers some creative breakfasts of crème brulee French toast and biscuits with chorizo gravy. If you’re looking for a simpler breakfast, hang out on Café Brioso’s patio at High and Gay Streets. Their dedicated roasters and baristas will prepare you perfect iced coffee, lattes with foamy art, and shots of espresso to go with fresh blueberry muffins and ham and cheddar scones. Weekend brunch is a busy affair, and both Tip Top Kitchen & Cocktails (73 E. Gay) and Jury Room (22 E. Mound) feature a solid line-up of Ohio comfort food on their brunch menus. You can enjoy a breakfast burger or a vegan breakfast sauté on Jury Room’s patio while you sip a pimosa (pineapple juice and champagne), or sit out front of Tip Top and feast on a breakfast burrito or sweet potato hash with a mimosa. Catch part 2 of this post, with all the best breakfast patios in other neighborhoods, coming up tomorrow!